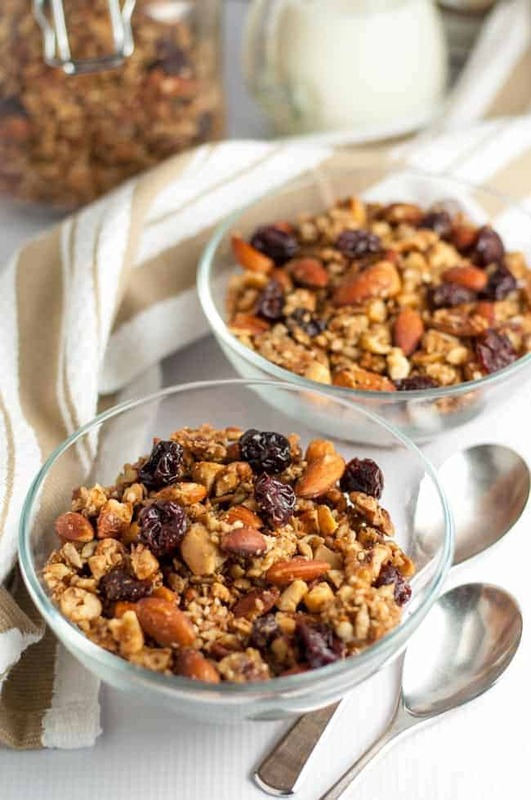 This Cherry Vanilla Grain-Free Granola has incredible flavour and crunch. 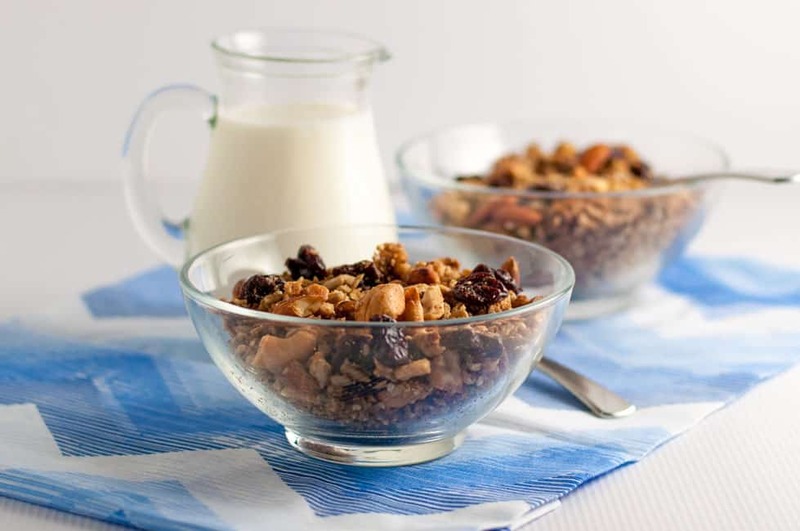 It makes a healthy breakfast with yogurt or milk and is a great mid-day snack mix. 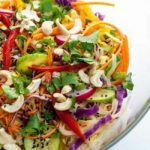 Now that the holiday weekend is over, it’s back to healthy and homemade for me. With a big container full of strawberries left over from making these Chocolate Quinoa Mini Bundt Cakes for Easter dinner, I decided to dress up our breakfast and I topped a bowl of this grain-free granola with them. Healthy, crunchy vegan and paleo grain-free granola with fresh sweet berries was a great way to start a new week. Did you enjoy your long weekend? Did you eat too much? With so much great food around it was hard not to. We had two Easter dinners! I’m so lucky that both my brothers and their wives live close by so that we can get together frequently. We had lots of laughs about things we did when we were kids. We were so much wilder than our own kids ever were . . . as far as we know, that is! Sunday was a family dinner at our house. I opted to barbecue some chickens on the rotisserie since we’re not fans of ham that is traditionally served at Easter. I served it with my favourite Strawberry Mango Arugula Salad, Crispy Lemon Oven-Roasted Potatoes, Roasted Carrots with Honey-Mustard Glaze, and some grilled fresh asparagus with feta. We finished off the meal with these Chocolate Quinoa Mini Bundt Cakes with Strawberries and I made this cute li’l bunny for the kids because they’re big fruit lovers. 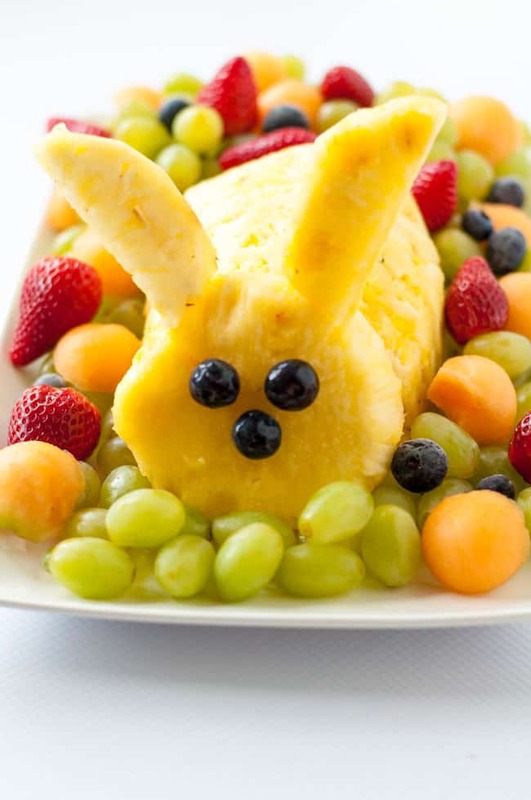 Fruit lovers with a quirky sense of humour, I decided, as I heard them giggling over making a bug-eyed bunny by changing the eyeballs from blueberries to grapes. Kids are so much fun! 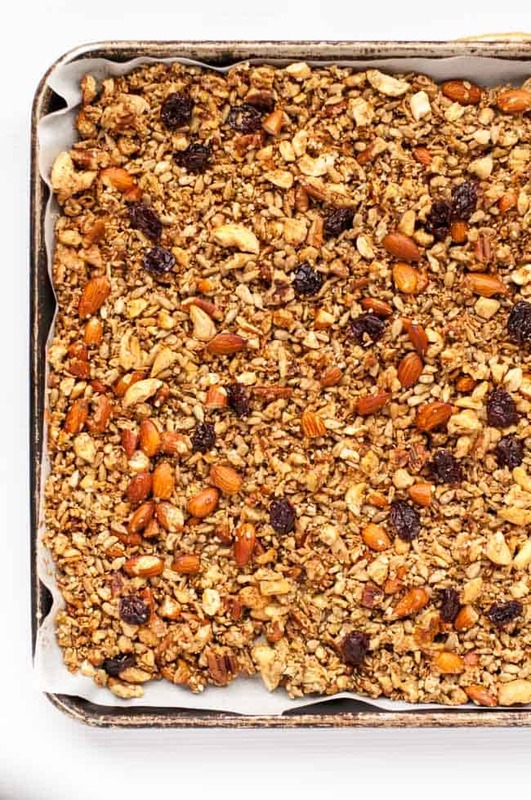 But back to this grain-free granola recipe! 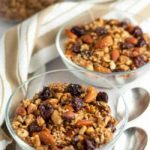 I have other granola recipes on this site because I make it all the time, but this one was particularly yummy. No oats, no grains: just nuts, seeds, hemp hearts, coconut and dried cherries. I flavoured it with vanilla and cinnamon and sweetened it with maple syrup. 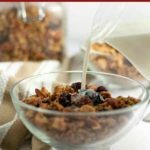 This recipe for Cherry Vanilla Grain-Free Granola takes no time at all! 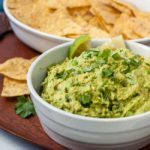 A food processor will save you a lot of time. Use it to chop the nuts, then transfer to a bowl and add the coconut, seeds, and hemp hearts. Stir in some coconut oil, maple syrup, vanilla and cinnamon and spread out on a baking sheet. Roast it in a slow oven, turning at 20 minute intervals until lightly browned. Your kitchen will smell heavenly! Remove from the oven and let it cool completely before storing. Any airtight container will work well. 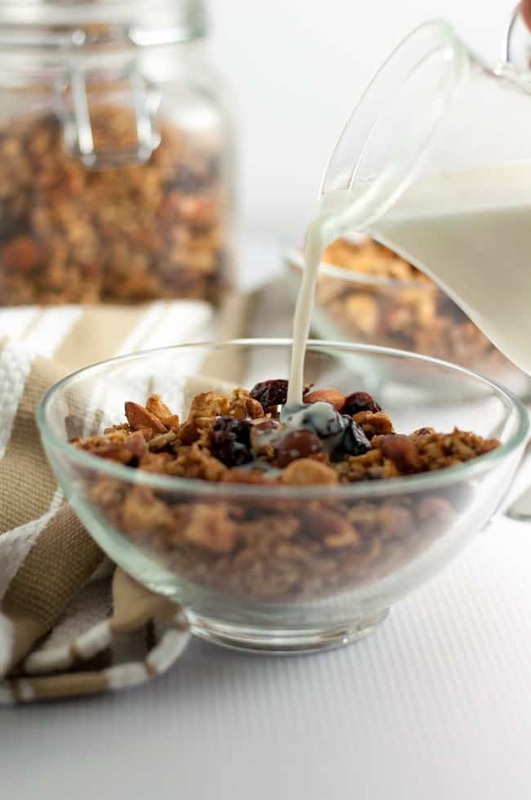 Your granola will stay fresh for a few weeks. 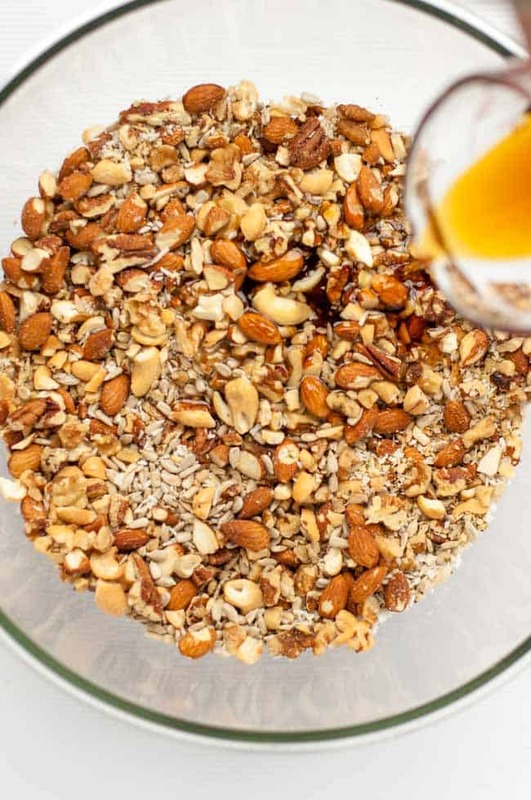 This recipe will make about 7 cups of granola. Enjoy! 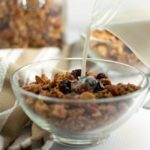 This Cherry Vanilla Grain-Free Granola tastes great with any plant-based milk or a dollop of Greek yogurt. And if you love that cherry-vanilla flavour combination, you’ll love this Cherry Vanilla Baked Oatmeal with Chia and Hemp, too. Heat oven to 275°F. and line a baking sheet with parchment paper. 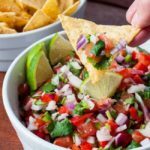 Chop nuts coarsely, either with a knife or in a food processor. In a large mixing bowl, combine all ingredients except cherries. Bake for 1 hour, turning at 20 minute intervals or until lightly browned. 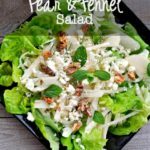 Cool and add cherries. 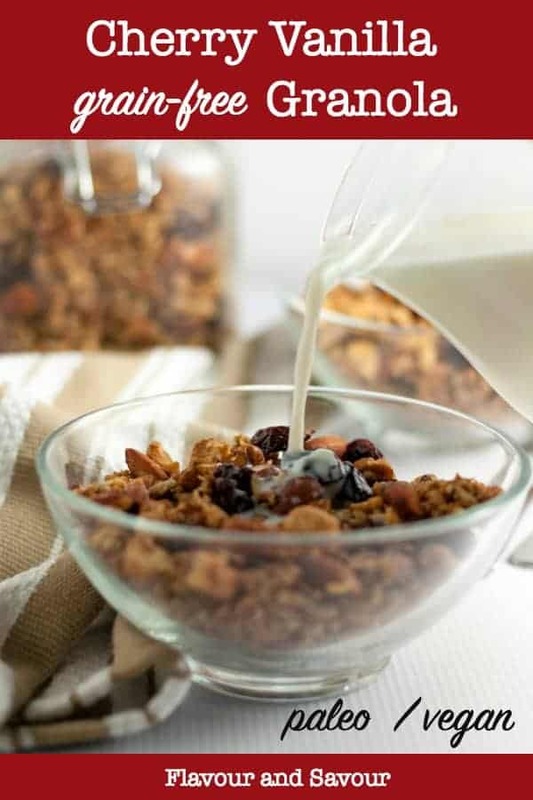 Serve with your choice of milk or yogurt or eat as a snack mix.